You are currently browsing the tag archive for the ‘zucchini dish’ tag. My twin babies fell madly in love with zucchinis. So, I buy big quantities of zucchinis and put them in pretty much every vegetable dish. I even like them raw in a salad. Their mild taste works for the days when there isn’t a single cucumber in the fridge. 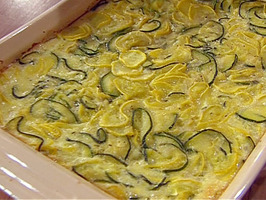 Since,in my opinion, a casserole is the easiest dish to feed the whole family, I like to make this simple zucchini bake. It tastes delicate enough to eat the leftovers for breakfast. Zucchini is rich in nutrients, especially manganese and vitamin C. One cup of cooked zukes contains 1.64g of protein and .15g of omega-3 fatty acids. You can make this recipe vegan by using flax or chia, instead of an egg and a vegan cheese instead of cheddar. I personally never tried using quinoa or gluten-free flour here, but am sure it’s possible. If you manage to make this casserole free of gluten, please, write me a note! Preheat oven to 325 degrees. Combine all dry ingredients and stir well. Mix in all other ingredients (except for ½ cup cheddar cheese) and stir well. Pour into a greased 8-inch pan. Bake for about 45 minutes. Sprinkle the second ½ cup grated cheddar cheese on top and bake an additional 15 minutes.